Until a while ago, developing a desktop application that was compatible with the most common operating systems required an enormous amount of expertise, different programming languages, and logics for each platform. Yet, for a while now, the evolution of web technologies has brought to our browsers many web applications/games that have nothing to envy from their desktop alternative. So, why not make desktop applications out of the very same technologies used in web development? You can install node.js by visiting https://nodejs.org/download/ and downloading the appropriate installer for your operating system. Node.js is a command-line tool. After installing it, the node command will be available on our terminal. To see if Node is installed properly, open the command prompt or a similar command line tool, and type node -v . This should print a version number, so you'll see something like this v8.9.4 . To see if NPM is installed, type npm -v to print its version number. Or you can force npm to not ask any question by invoking it with -y, it will use defaults and not prompt you for any options. It's okay to choose the defaults. You can edit the package.json later in a text editor. For more information on npm init command, visit https://docs.npmjs.com/cli/init. For more information on package.json, visit https://docs.npmjs.com/files/package.json. We suggest installing Electron globally. Later, if you need to install Electron in a project, you should install it locally. For more information, visit: https://www.npmjs.com/package/electron. Create a new folder duplicate-file-finder. 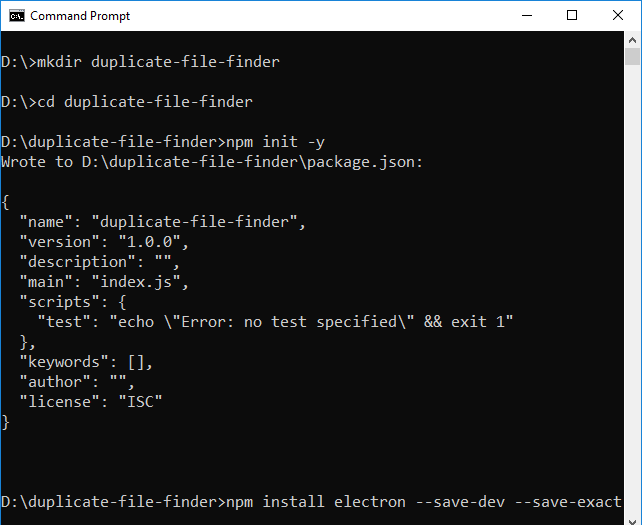 Open command prompt or terminal and change directory to duplicate-file-finder. Generate package.json file by invoking npm init -y command. Install Electron.js by invoking the npm install electron --save-dev command inside the project folder. Open package.json in a text editor and Update the main and add a start script to scripts, as highlighted in below sample file (line 4 and line 7). The filename specified by the main field (line 4) in package.json file is the entry point of for the application. The main field is optional, if this field not present in the package.json file then Electron.js will attempt to load index.js file.